There is something very important I want to share with you, so listen deep. 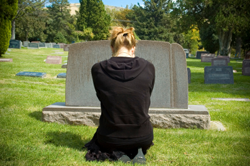 As a bereavement counselor I speak with numerous people on a daily basis about loss. The number one thing I feel from people is guilt. The words pour out of them, “If I hadn’t take them to the hospital…” or “What if I hadn’t put him in a nursing home?” “I should have called her more.” Let me tell you something: In those moments when you made the decisions to do or say what you did, you were reacting from that moment and the love in your heart . I listened to her go on, she might as well had someone punching her telling her over and over again you’re a bad daughter. After she was finished I said, “ Can I share something with you?” I began to explain to her what dying truly is. Her dad was 91 full of life until he fell, she took him to the hospital but he continued to decline from his fall. They brought him home and he died. I spoke to her gently saying when he fell, you did what any daughter would do, you love your dad and your first response was he needed to go to the hospital to be checked out. A bunch of things can go wrong with a 90-year old body after it falls. Here’s the most important point, in order to die we have to leave these bodies behind. Unfortunately, most of the time we leave our bodies through disease and accidents. Unless, of course, your one of those very blessed souls, who dies peacefully in their sleep. I wish that for all of us. This beautiful woman who I was talking to became silent on the other end of the phone. She wanted to be freed from the endless suffering the brain can create when we keep going back to second guess our actions. Truly, this second-guessing is wasted energy. These thoughts are a non-thing, something the mind creates. Why you ask? Because we are human, the left-brain has a field day analyzing. Try not to analyze too much when your grieving it can put you into a downward spiral. I teach people ways to help with this because when we are grieving the present moment is our friend. I know this because it is what helped me with my own parent’s deaths. Below is a simple exercise you can do to train your mind out of that loop. When you are beating your beautiful self up, please go into your heart. Sit down, put your hand on your heart, close your eyes, and breathe, just breathe, slow down the breath slows down the busy mind. Losing a loved one is so traumatic no matter the age, changing your life forever. Nurture yourself! As you sit please bring the most loving memory of the loved one into your heart. Continue to breath in and out slowly. When you think of a loving memory, bring in all the senses too. The smells, the FEELINGS, laughter, warm smiles, hugs. See the colors of the memory and even what you may have heard. Recall that life, and the gifts that came with it. You can change that downward spiral; get out of that loop in the brain. As with any new practice take your time with this. If the mind wanders gently bring it back with the breath even if you have to say the words I am breathing in… I am breathing out. All this little mindful exercise does is slow down the brain, refocusing into the present moment. Recently loss my husband of 18yrs in Oct 2015. He wAs a good man and dad. I really enjoy this excercise. I can tell you this works in all circumstances. As the last few years of my life has been turned all over. My dad passed away 2012 husband 2015. Two of the most important men in my earth life. I am blessed to have had them both. They’ve taught me I can do this. I am not angry, I am at times sad but then I hear you word or something said that they would say and the sadness goes. God is with me all the way. I also lost my husband in October of 2015. We had just celebrated our 25th wedding anniversary. He was a good man and a wonderful father to our three children. I miss him so much. My entire world was built around him and our family. I grieve for him every day and will never get over him. I have been going through grief process myself. My mother died on February 19, 2016. She was suffering from cancer and her cancer was discovered while she underwent an operation for gallstones. Her operation was on January 5 and she breathed her last on February 19. Ever since her diagnosis and then her death I have been going through terrible misery and pain. I keep getting flashbacks and my mind keeps on recalling what happened in the past two months. A lot of “what ifs” going through my mind, just like what was mentioned in the article. I am trying to get over it, but my suffering has actually made me blind to everything else. It will take sometime to get over it. It is a beautiful article, an eye opener really. I hope many people will benefit from it. I know, I have. I benefited from the article You did the best you could. It’s going on 3 years that my mom has passed and I still find myself wondering the “What ifs” As a daughter there isn’t a day that passes that I don’t miss my best friend. It is true that you have to make decisions and at the time try your best. It really stroke a chord. I also know that grieving can take years – at 54 years old I had no idea how hard it was to lose your mom.